Newspaper ads are a great way to reach your target demographic. The local paper's entertainment section, or weekly independent tabloid are the best bets. 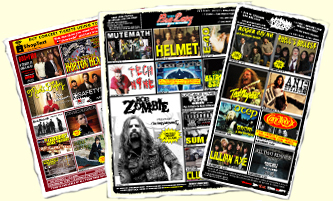 Concert ads are the most popular parts of the newspaper. Sometimes I think the newspaper should be paying the promoter to put ads in thier paper. I am convinced readers are drawn to the papers to in many cases, just to read our ads. We can lay out a single event display ad or a complex strip ad for you. We specialize in fresh exciting layouts that will get attention, crisp sharp text and logos and extremely fast turnaround times. Large arena shows need the extra exposure that newspaper ads can provide. Especially when you need to attract an older demographic. 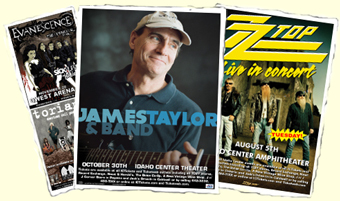 On larger national tours, admats are usually available from Tour Design, or Bill Young. I can order these for you. Often, the breaking ads must be approved by artist management before sending to press. If you have several events a month, a strip ad listing upcoming events, and the new onsales will become a must read for everyone in your city that wants to keep up on who is coming to town. This is a great option that really pays. Some smaller local newspapers will print a tabloid newspaper for a very low fee. For around $1300 they printed several thousand copies of a 20 page tabloid with full color covers. You can sell advertising to local businesses, and you can charge the band at settlement for the advertising space like any other ad. So you will actually make money doing this. The catch is you need to have a lot of shows going on to fill the space. Usually this is good to put out in the Spring as a Summer concert series is going on sale, but if you have a concert club that has a never ending flow of concerts, it could be done at any time. It is also helpful to have some articles so it is not just 20 pages of ads, and a street team to get the papers delivered.